Software Development Process - The ACI Process Model was created utilizing industry best practices as an iterative approach to plan, develop, and deploy custom designed applications that solve our client’s business needs. Our process encourages customer involvement throughout the entire development life cycle and builds upon the knowledge gained during each step of the process. 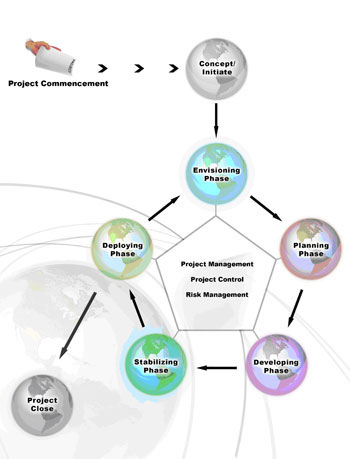 Each area of our process contains important information for both the ACI development team and our clients as well. Stabilization Phase – During this phase, the team will execute the test plan created during the planning phase. ACI can offer additional testing such as usability or load testing upon the request of the client. Additional testing must be added to the project schedule and budget. Upon completion of successful testing, the project will move into the deployment phase. After the product is successfully delivered to our client, ACI will continue to guarantee our delivered solution for an indefinite period. While hosting with us, you may find issues or bugs that are a result of the development of your software by ACI. If an issue is determined to be a result of ACI's development work on your website, these issues will be dealt with at no charge. If an issue is determined to be the result of other changes by you, or otherwise the result of issues outside of our control, you will be billed hourly for time spent resolving the issue.